NEW FREE COMMUNITY GATHERING THE 2ND SAT OF EVERY MONTH!! Each month this FREE, ALL-AGES, COMMUNITY gathering will be bringing together over twenty local vendors, restaurants, organizations, artists and music collectives to the West Adams Neighborhood. Activities include shopping, live music, art exhibits, deejays, food, dancing, drinks, bouncy castle, giveaways and more. 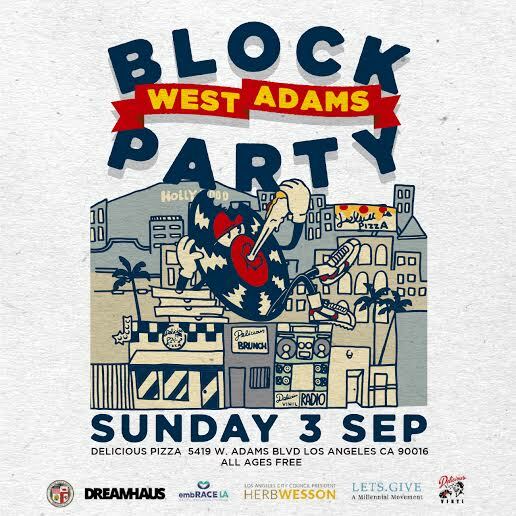 We love a good party, and the West Adams Block Party at Delicious Pizza is going to be one of the best. Hosted by Delicious Vinyl and embRACELA, the free event is a celebration of music, arts and cultural diversity in our community and features live jazz, funk, soul and hip-hop artists as well as hot sounds from Soulection DJ’s, Boomyard LA, Delicious Vinyl and SoulPeople Sound System. Fun for the whole family including games, face painting, and the West Adams castle jumper. And if that’s not enough to tickle your fancy, you can tickle your tastebuds at the Dilla’s Donuts Pop-Up Shop inside the Delicious gallery! So remember to save the date. This is one hoot fest you won’t want to miss. It's official! The rumor everyone's been talking about for the last few months is now confirmed. LAEater article today shared the news that a new restaurant/brewery will be going in just E of Fairfax on Adams, and down the street from Delicious Pizza & Vee's Cafe. They will join 2 other restaurants nearby who are slated to open in 2018. 4900 Gallery will be featuring the works of long time West Adams resident designer, artist and restauranteur Fred Sutherland. Located at 4900 W Adams Blvd. 90016, opening event from 6pm-10pm May 20th. Got to celebrate the pre-launch/holiday party at Delicious Pizza last week! If the logo seems familiar, it certainly should...Delicious Pizza is the newest endeavor from Mike Ross, co-founder of the iconic Delicious Vinyl record label. Ross has teamed up with local West Adams designer/restauranteur Fred Sutherland, whose resume includes legendary LA spots like Deep and Fred62. With a stylish new facade, high ceilings and a crisp, modern interior, Delicious Pizza is destined to be the new hub of the West Adams neighborhood. For the celebration, Mike and his brother, Rick Ross, brought in DJ Numark and Slimkid3 in to DJ sets from their new record (which was amazing!) and the night topped off with an impromptu set from The Pharcyde. As if that wasn't enough of a treat, folks got to see what the new place is all about. The restaurant will be offering loads of classics plus plenty of new twists courtesy of chef Travis Sutherland. Delicious Pizza is set to open in Jan 2015. You'll definitely want to check it out!